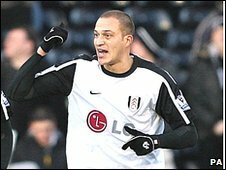 Bobby Zamora's 11th goal of the season was enough for Fulham to hold off a spirited fight by League One Swindon Town in the FA Cup third round. Zamora struck on 16 minutes, latching on to Stephen Kelly's long ball and flicking neatly past David Lucas. Lucas kept Swindon in it when he saved Andy Johnson's second-half penalty after escaping a red card for hauling down the former England striker. Swindon had spells of possession but Simon Ferry wasted their best chance. Fulham manager Roy Hodgson - fresh from signing a new 12-month contract in the week - was able to hand a first start since October to fit-again striker Johnson. That change restored Johnson's partnership with Zamora, who has been touted as an outside bet for Fabio Capello's England World Cup squad. And the pairing was quick to click once more, Zamora threatening inside two minutes when he dummied and fired wide from 10 yards before opening the scoring on 16 minutes for his sixth goal in seven games. Stephen Kelly's long ball sent the former Spurs striker clear and he held off Gordon Greer before neatly flicking past a helpless Lucas. The early setback was a body blow for the Wiltshire side but Danny Wilson's Robins are in a good run of form themselves having lost only once in their last 11 games and they responded well against the in-form Premier League side. Ferry had already snatched at his early opportunity, sending his shot high and into the 6,500 travelling fans behind Mark Schwarzer's goal, before the Australian keeper was forced into a smart save from Billy Paynter. Paynter saw another shot apparently deflect over the crossbar, but failed to get the corner his effort merited, and the League One side's spirited response was almost punctured on the stroke of half-time as Fulham's dangerous strike duo wasted two glorious chances in the space of a minute. First, Zamora found himself unmarked from a well-worked short corner routine and should have done better than to head over, then Johnson escaped the attention of two defenders before firing a fierce shot that flew inches wide. Swindon's period of possession continued after the break as Wilson's hard-working side took the game to a team 41 places above them in the football hierarchy, but their final ball continually let them down. And Fulham wasted a string of chances to put the tie beyond doubt as Lucas saved well to deny Johnson on the hour, before an even more crucial stop two minutes later. Lucas feared the worst when he hauled down Johnson for a clear penalty as the striker looked to shoot, but escaped with a booking and made the most of the reprieve by diving to his left to keep out Johnson's spot-kick. The former Crystal Palace hit-man showed no lasting effects from the groin injury that has kept him out for more than two months and saw another stinging shot fly just off target before making way for Zoltan Gera late on. Despite the narrow margin Fulham always appeared comfortable, though Schwarzer was forced into a late save from Jon-Paul McGovern's free-kick as Swindon went down fighting. Fulham manager Roy Hodgson: "Chris Smalling did well for us again, the game suited him. "I thought we were the most dangerous in front of goal - we should have scored the second goal with the likes of (Andy) Johnson and (Clint) Dempsey. "(Bobby) Zamora was angry for not scoring the first chance which he set up for himself early on - it was a very fine strike and throughout the game I thought he did well. "The play between the two of our centre forwards was quite good, in fact, in the second-half some of our play was as good as it gets." Swindon boss Danny Wilson: "Chris Smalling was excellent last week at Chelsea and he was fantastic today so they have a good player on their books here at Fulham. "It was a big decision to bring him here from non-league football and I think Roy (Hodgson) has got it spot on." 90:00+3:04 The referee ends the match. 89:07 Corner taken by Bjorn Helge Riise from the right by-line played to the near post, Jonathan Douglas makes a clearance. 85:30 Substitution Michael Timlin is brought on as a substitute for Daniel Ward. 85:30 Free kick awarded for a foul by Jonathan Greening on Lloyd Macklin. Alan Sheehan takes the free kick. 84:29 Alan Sheehan gives away a free kick for an unfair challenge on Bjorn Helge Riise. Indirect free kick taken by Jonathan Greening. 83:05 Foul by Stephen Kelly on Daniel Ward, free kick awarded. The free kick is delivered right-footed by Jon-Paul McGovern from left channel, save by Mark Schwarzer. 82:06 Substitution Zoltan Gera is brought on as a substitute for Andrew Johnson. 82:06 Paul Konchesky produces a cross, Shot from inside the area by Bjorn Helge Riise clears the bar. 81:30 A cross is delivered by Alan Sheehan, Daniel Ward takes a shot. Save by Mark Schwarzer. 79:07 Free kick awarded for an unfair challenge on Lloyd Macklin by Stephen Kelly. Indirect free kick taken by Alan Sheehan. 77:56 Free kick awarded for an unfair challenge on Scott Cuthbert by Bobby Zamora. David Lucas restarts play with the free kick. 77:03 Shot by Clinton Dempsey from outside the box goes high over the target. 76:10 Andrew Johnson has an effort at goal from deep inside the area missing to the right of the target. 75:09 The referee blows for offside. Mark Schwarzer restarts play with the free kick. 71:46 Gordon Greer takes a shot. 71:08 Corner taken right-footed by Jon-Paul McGovern to the near post, Aaron Hughes makes a clearance. 69:51 Free kick awarded for a foul by Alan Sheehan on Bjorn Helge Riise. Aaron Hughes takes the free kick. 69:08 Jon-Paul McGovern fouled by Jonathan Greening, the ref awards a free kick. Jonathan Douglas restarts play with the free kick. 66:08 Paul Konchesky produces a cross, Scott Cuthbert gets a block in. 65:48 Jon-Paul McGovern gives away a free kick for an unfair challenge on Bjorn Helge Riise. Free kick taken by Jonathan Greening. 64:08 Substitution Lloyd Macklin joins the action as a substitute, replacing Ben Hutchinson. 63:42 Bjorn Helge Riise takes a shot. Save by David Lucas. 62:00 Penalty taken by Andrew Johnson is saved by David Lucas. Fulham 1-0 Swindon. 62:00 Booking David Lucas is cautioned. 61:58 Penalty awarded for an unfair challenge on Andrew Johnson by David Lucas. 60:50 Andrew Johnson takes a shot. Save by David Lucas. 59:46 Daniel Ward takes a shot. Blocked by Chris Smalling. 58:15 The ball is swung over by Kevin Amankwaah, clearance by Chris Smalling. Short corner taken by Alan Sheehan from the right by-line. 55:51 Free kick awarded for a foul by Chris Smalling on Billy Paynter. Strike on goal comes in from Alan Sheehan from the free kick, Mark Schwarzer makes a save. 53:42 The ball is delivered by Paul Konchesky. Bjorn Helge Riise takes the inswinging corner, Bobby Zamora produces a right-footed shot from inside the area that goes over the bar. 53:11 Kevin Amankwaah takes a shot. Clinton Dempsey gets a block in. 50:54 Ben Hutchinson takes a shot. Save made by Mark Schwarzer. 49:37 The official flags Andrew Johnson offside. Free kick taken by David Lucas. 47:36 Kevin Amankwaah crosses the ball, save by Mark Schwarzer. 45:23 The ball is crossed by Alan Sheehan. 45:00+0:58 The half-time whistle blows. 45:00+0:06 Effort from the edge of the area by Andrew Johnson goes wide of the right-hand post. 44:03 Jonathan Greening produces a cross, Headed effort from deep inside the penalty area by Bobby Zamora goes harmlessly over the crossbar. 42:59 The ball is swung over by Ben Hutchinson. 42:05 Andrew Johnson crosses the ball, blocked by Gordon Greer. Outswinging corner taken by Bjorn Helge Riise from the right by-line, Scott Cuthbert makes a clearance. 41:20 Daniel Ward delivers the ball, Mark Schwarzer makes a save. 38:57 Chris Smalling gives away a free kick for an unfair challenge on Billy Paynter. Jonathan Douglas takes the free kick. 37:42 Billy Paynter takes a shot from just inside the penalty box which clears the bar. 32:28 Jonathan Greening concedes a free kick for a foul on Jon-Paul McGovern. Jonathan Douglas restarts play with the free kick. 29:24 A cross is delivered by Paul Konchesky, David Lucas makes a save. 28:28 A cross is delivered by Bjorn Helge Riise. 27:55 The referee blows for offside against Jon-Paul McGovern. Direct free kick taken by Aaron Hughes. 26:07 Shot from just outside the area by Jon-Paul McGovern goes over the bar. 24:55 Free kick awarded for a foul by Jonathan Douglas on Andrew Johnson. Jonathan Greening takes the free kick. 24:37 Bjorn Helge Riise produces a cross. 22:43 Ben Hutchinson fouled by Stephen Kelly, the ref awards a free kick. Alan Sheehan restarts play with the free kick. 22:05 Centre by Alan Sheehan, Aaron Hughes makes a clearance. 20:32 Free kick awarded for a foul by Daniel Ward on Paul Konchesky. Mark Schwarzer restarts play with the free kick. 19:45 Corner taken by Bjorn Helge Riise played to the near post, clearance by Jonathan Douglas. 19:25 Ben Hutchinson takes a shot. Mark Schwarzer makes a save. 18:43 Stephen Kelly delivers the ball, Andrew Johnson takes a shot. David Lucas makes a save. 17:33 Jon-Paul McGovern crosses the ball, Header from deep inside the penalty area by Billy Paynter goes harmlessly over the crossbar. 15:45 Assist by Stephen Kelly. 15:45 GOAL - Bobby Zamora:Fulham 1 - 0 Swindon Bobby Zamora fires in a goal from inside the area to the bottom left corner of the goal. Fulham 1-0 Swindon. 14:00 Unfair challenge on Andrew Johnson by Jonathan Douglas results in a free kick. Jonathan Greening takes the free kick. 13:43 The ball is delivered by Bjorn Helge Riise, clearance made by Jonathan Douglas. 11:27 Shot on goal by Simon Ferry from just inside the area goes over the target. 8:18 A cross is delivered by Alan Sheehan, Daniel Ward takes a shot. Save by Mark Schwarzer. 7:19 Bjorn Helge Riise sends in a cross, clearance by Simon Ferry. 5:44 Clinton Dempsey takes a shot. Corner taken right-footed by Bjorn Helge Riise from the right by-line to the near post, clearance made by Kevin Amankwaah. 2:25 Chris Smalling gives away a free kick for an unfair challenge on Billy Paynter. Scott Cuthbert restarts play with the free kick. 1:48 Bobby Zamora produces a right-footed shot from deep inside the six-yard box which goes wide of the right-hand post.